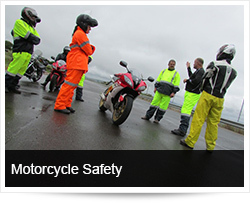 Among all motor vehicles, motorcycles are the most vulnerable on the road. As motorcycles do not have seat belts, you can be thrown off your seat in a crash, which can result in serious injury or even death. Imagine your chance for survival if a truck strikes you, or if you strike it. Hitting a truck is like hitting a steel wall. However, your chance for survival will be increased if you wear a helmet and follow the safety tips below when riding your motorcycle. Make sure to always wear a helmet. Beware of helmets that do not meet the correct safety standards. Helmets are the most important piece of equipment you can wear when riding your motorcycle. A helmet could be your only source of protection in a serious crash. Motorcycles are the smallest vehicles on the road. Unfortunately, they provide virtually no protection in a crash. Other drivers may not see you on your motorcycle, so you must be aware of everything on the road. Be extra cautious, paying attention to the signals and brake lights of other vehicles, especially trucks. However, you still need to be prepared in the event their signals or lights don't work. Ride with caution and drive defensively. Even though your motorcycle may be small, you must adhere to the laws of the road. Never ride in between lanes in traffic or share a lane with another vehicle. Don't instigate aggressive driving with other motorists; you will only increase your chance of a crash. Conduct a safety inspection of your motorcycle before each ride, and wear protective clothing including gloves, boots and a jacket. Proper maintenance and protective clothing will help reduce your chance of a crash or the severity of injury if you are involved in a crash, especially with a large truck or bus. With the assistance of Hein Jonker, editor of Bike Talk, we also addressed specific riding techniques and road conditions.